Donald Trump is "the unprecedented president." He is now the United States' 45th president. Historically, the United States has never had a president like him: a multi-billionaire businessman with no previous government experience, the oldest first term elected president, twice divorced, and a television showman. Trump captured his party's presidential nomination from 16 other Republican rivals, lost the three presidential candidates' debates seen worldwide, trailed in the public opinion polls up until general election night, and won an election nearly all of his supporters expected him to lose. Tim Chambless, Associate Professor/Lecturer in the University of Utah's Department of Political Science, and Academic Outreach Coordinator for the University of Utah's Hinckley Institute of Politics, will explain the 2016 presidential election in its historical context, raise fundamental questions about the uniqueness of this election, and provide answers to the many questions still being pondered by millions in the U.S. and internationally. In doing so, he will compare and contrast how the State of Utah voted in relationship to the nation. Additionally, he will consider the views of Donald Trump and those who are trying to understand him – in their own words. The day of the lecture, March 29, 2017, is the 68th day of the Donald Trump presidency. Every day his name dominates news reports. His supporters praise his forceful actions, and hope he can deliver on his campaign promises. His critics fear he is weakening the nation, and many are considering impeachment. As Americans and Utahns, where do we draw the line between taking him literally and taking him seriously? Wherever, factually, undeniably, Donald Trump is "The Unprecedented President." PARKING: Parking is free for guests and media at Rice Eccles Stadium. Tim Chambless is an Associate Professor/Lecturer in the Department of Political Science and is the Academic Outreach Coordinator for the Hinckley Institute of Politics at the University of Utah. He was born and raised in Houston, Texas, and earned his B.A. at the University of California at Santa Barbara, and earned his Master's Degree and Ph.D. at the University of Utah where he wrote his thesis and dissertation on investigative reporter Jack Anderson and the Watergate scandal. Tim is a strong believer in government service – that government enhances the public good. 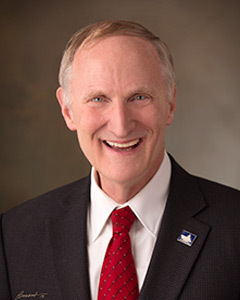 Prior to university teaching, he worked for Salt Lake City Mayor Ted Wilson and Utah Governor Scott Matheson, Congressman Wayne Owens and U.S. Senator Frank Moss. He has worked in 34 political campaigns for Democrats and Republicans. Since 1982, Tim estimates he has taught over 30,000 university students, and has written hundreds of letters of recommendation. He has taught classes in American National Government and Political Parties, State and Local Government as well as Law and Politics, Controversial Legal Issues and Constitutional Law. For 15 years he handled The Constitution telecourse seen statewide on KUEN-TV Channel 9. Each year since 1994, he has led a Hinckley Institute of Politics student seminar to Washington, D.C. where the nation's capital is the students' classroom; this May will be his 24th consecutive "Capital Encounter" week. Also this May, he and his wife Cathy will co-lead a U of U Go Learn class to Washington, D.C. Since 2007, he has taught Osher Lifelong Learning courses on the U campus (Current Events, Conspiracy Theories, Terrorism Law). For four years, he assisted the late Utah Senator Bob Bennett with a seminar that highlighted U.S. politics and government, history and business and economics. Tim believes in public service and community engagement as essential for good citizenship. He served over 20 years as a volunteer citizen planner on the Salt Lake City Board of Adjustment and the Salt Lake City Planning Commission, served on the City Policy-Citizen Review Board, and the Salt Lake County Fine Arts Advisory Board. In 2011, he was vice chair of the Salt Lake County Citizen Reapportionment Advisory Commission. He served 10 years on the board of the Utah Chapter of the ACLU. In recent years, he speaks 4-5 times a week to senior citizen groups. He has observed the Utah State Legislature for four decades – as an intern, city staff member, Channel 7 reporter, Hinckley Institute intern coordinator, U of U political science professor, and as a concerned citizen. Tim is married to Cathy Chambless who is a senior policy researcher for the Kem C. Gardner Policy Institute at the University of Utah, where she teaches Disability Studies. They have a son Ross (wife Ikue) and daughter Dominique (husband Mike). RSVPs are now closed. Thank you.